March 6 marked the six-year anniversary of the spark that led Syria down the fiery rabbit hole of revolution. To be sure, a lack of leadership in the West allowed the horrific violence to metastasize, providing an opportunity for Iran and Russia to expand their influence as they prop up the regime of Bashar Assad. It was therefore jarring to many to see recent headlines such as, "Hezbollah, Russia and the U.S. help Syria retake Palmyra." The question is, does it represent a policy shift by the Trump administration based on the notion of a shared common objective with Moscow in Syria? 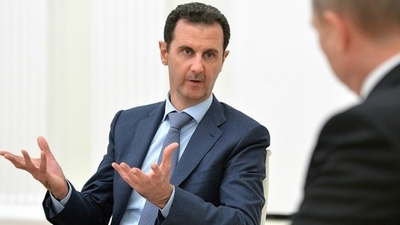 Either way, it has blown fresh wind into the sails of those who argue that Assad should remain in power as a check against the forces of Islamic radicals. There are several problems with that argument; most glaringly, it ignores the war crimes and other atrocities committed by the regime. That long and horrific list includes chemical attacks, mass hangings, mass graves and the targeting of hospitals and schools, not to mention the arrest and torture of the 15 school boys six years ago that sparked the demonstrations in the first place. Keeping Assad in power would undermine both America's credibility and core values. Besides the heavy moral equation, Assad doesn't have the military capability to hold Syria together. The case of the ancient city of Palmyra serves as an illustrative example. Since May 2015, the city has changed hands several times between pro-regime forces and ISIS. Although Assad's forces retook the territory with Russia's help in March 2016, they were unable to hold it while engaged in their December assault against Aleppo. Only after the city fell were pro-Assad forces able to retake Palmyra in early March 2017. What's left of Assad's army is an empty shell, precariously held together by Russia, Iran and Hezbollah, in decreasing levels of importance. Any plan to keep Assad in power, short of a robust U.S. military presence in support of his regime, means turning Syria into a Russian and Iranian state. Such an outcome clearly runs counter to American interests. Upon closer inspection, the very fabric that held Syria together is irreparably torn. To fully appreciate why and how requires an understanding of what made Syria function — and led to dysfunction — under the house of Assad's rule. The Assad family is part of the state's 10 percent minority Alwai religious denomination, a ninth century heterodox offshoot of Shiite Islam considered heretical by most Sunnis and extremist by most Shiites. Hafez Assad ruled as a dictator over the majority Sunni population that made up some 75 percent of the country, from 1970 until his death in 2000, when his son Bashar took over. To rule Syria, the Assads had to tailor their approach to the numerous ethnic groups, at times appealing to or oppressing them, or setting them against one another. Unifying such a diverse mix was difficult given Syria's patchwork demography and explains, in part, why Baathism was the regime's ruling ideology. It was Marxism superimposed over pan-Arabism, at the expense of Islamism. In practice, it meant controlling all levers of power and reinforcing their leadership and kinship through family marriage when possible. They also gave prominent positions to individuals of the Sunni majority, upon whose patronage they relied. In essence, they created a new tribe that inspired, if not demanded, loyalty. Many analysts failed to recognize that, by 2011, secularism was already on the retreat throughout the region. Like other regional states, the Assads forbade the development of any other liberal centers of thought and cohesion — much less a free press — that could challenge his authority. Nevertheless, the experiment of independence dramatically failed in Egypt, Tunisia, Libya, Syria and Iraq. The pan-Arab ideology of belonging to a greater Arab nation, greater than the state, was found to be bankrupt and based on empty promises. Of greater concern to regime stability was political Islam, which had to be harshly dealt with from time to time, such as crushing the Muslim Brotherhood during the Islamic revolt in Hama in 1982. That costly episode led to tens of thousands being killed, which was at the time the single deadliest act by an Arab government against its own people. Nevertheless, they could not forbid public worship and could only to a limited extent control the sermons at the mosque. For centuries, the key unifying driver of allegiance and cohesion was Islam or the Muslim community, followed by loyalty to the dynastic ruler of the empire or caliphate, and finally, local loyalty, whether it was sectarian, tribal, regional or social. Naturally, when the state broke down, political Islam was the most attractive and unifying alternative ideology. It had several advantages. Religious groups could regularly meet and assemble and rely on pre-existing Islamic networks outside of the state's full control. Islam was understood regardless of one's educational level or social strata, and had familiar symbols and slogans that evoked a historical memory. It also inspired far more cohesion than the French Mandate-imposed borders of the state. The initial protests in Syria may not have been designed to bring about a greater role for Islam in the government, but the mosques became central in influencing the trajectory of the uprising nonetheless. Add to it the fact Syria served as the primary gateway for foreign jihadists entering Iraq to kill American soldiers since the fall of Hussein in 2003, and one can see how Assad helped create Islamist Frankensteins, many of whom returned to establish an ISIS caliphate with Raqqa as its capital. Having turned on the majority Sunni population of his country, Bashar Assad stands today as a great magnet to which jihadists of all stripes are attracted. There are no pillars left upon which Assad's legitimacy can rest; Bashar Assad can't "Make Syria Great Again," if it ever was in modern times. The majority of Sunnis are at war with the Alawis and Shiites, be they Arab Hezbollah or Persian Iranians. The question is, who can better defend them — groups such as ISIS and al Qaeda's affiliate, Tahrir al-Sham, or the Free Syrian Army and U.S.-backed rebels? American collusion with Russia will just prolong the war. It remains to note, the name "Syria" (pronounced in Arabic as Suriyya) is of ancient Greek origin and was long forgotten for hundreds of years until it was resurrected in the 19th century by local non-Muslims. The name reflected no overarching identity, evoked no national memory, and held no historic relation to the common language of Arabic. Paradoxically, entering the seventh year of the conflict, the Syrian state exists today in name only.